They are the unsung heroes of rallying. In the service park, ŠKODA Motorsport’s mechanics fight for seconds as fiercely as the drivers do during the rally stages. Read their thrilling stories from behind the scenes. Being a ŠKODA Motorsport mechanic is more than a full-time job. These team members spend days building and preparing ŠKODA FABIA R5 rally cars by hand – some for the factory team, more of them for customer teams. Don’t forget that ŠKODA Motorsport has sold almost three hundred of these rally cars around the world. What’s more, the factory team members spent a full 130 days abroad at WRC events last year. This means that they are far away from home for a large part of the year – and rallying means long periods of waiting interspersed with moments of extreme stress. Not everyone can handle this. “It’s not just a matter of being manually skilled; you also have to be quick and alert. During a rally, you simply can’t spend 10 minutes replacing the brakes. Besides being in good shape physically, you also have to be very tough mentally – you have to be good at coping with stress without panicking. 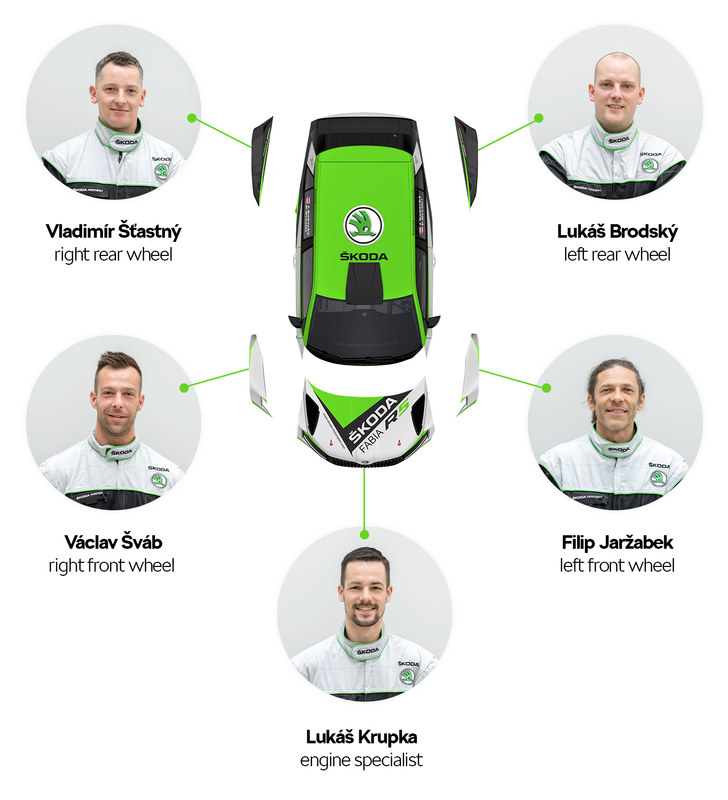 When there’s more work to be done on the car than you have time, you have to decide quickly what’s worth doing and you have to be flexible in decision-making with others,” explains Václav Šváb, a member of ŠKODA Motorsport for eight years. During a rally, each mechanic is responsible for one quarter of the car, which they know inside out. Usually, they keep to that section of the car for the whole of the season: front left, front right, rear left, rear right. Of course, they have the skills to service any other part of the car, too, but the target is 100% performance. For example, if you’re handed the front right wheel position, that means you’re responsible for the axle, damper, brakes, lower part of the engine, wing, door, co-driver seat and other interior parts. It is also important to keep an eye out for leaks, such as any sign of the brake fluid seeping out. There are also marks on each and every screw to indicate the slightest move. The fifth member of the team of mechanics is the engine specialist, who focuses, obviously, on the engine. This person also serves as the chief mechanic and makes sure the whole team is working in harmony. The engine specialist goes through the checklist of tasks and sees if anyone needs help. His orders, in turn, come from the chief technician, who is in touch with the crew during the race. For example, if the driver notices a big bang or jolt during the stage, the team pre-emptively replaces certain parts. In the service park, there’s no time for complicated measurements and gauging. First and foremost, problems need to be prevented. Another important factor is that, if the driver spends several seasons with a team, he retains the same mechanics, as they know him well and are well-coordinated. 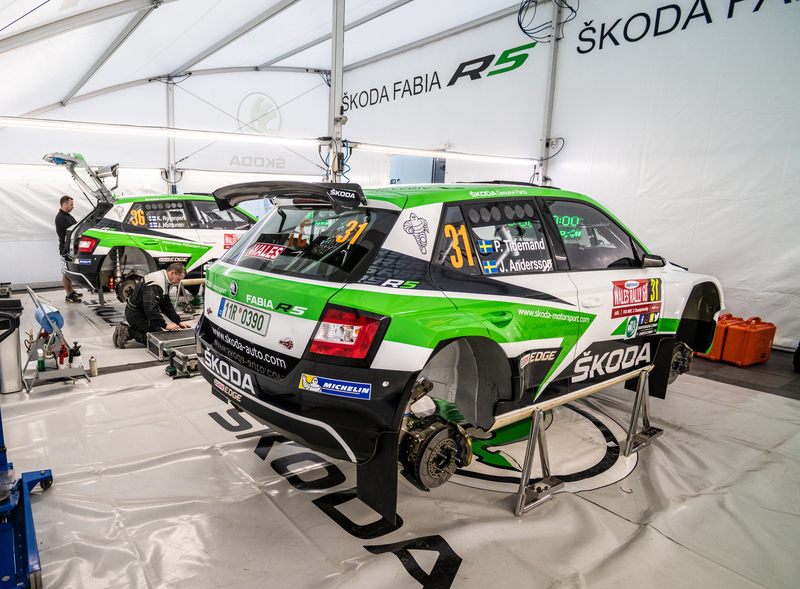 All mechanics praise the qualities that the ŠKODA FABIA R5 has shown in recent years at rallies around the world. “This car gets the job done. It’s robust, it’s not needlessly complex and, for me, it’s a joy to work on. Compared to other models, it is a very nice car from a mechanic’s point of view,” explains Lukáš Brodský. And Lukáš Krupka agrees: “I know that many mechanics love the the FABIA S2000, but the R5 is easier to work on and the build quality is on another level. A new version is now in the pipeline and we expect it to be another step forward. The next one will probably be self-repairing and we’ll just stand and watch,” he laughs. These are perhaps some of the reasons why no one in the team is thinking about leaving this unusual line of work in the foreseeable future. For most of them, cars, and especially motorsport, have been a lifelong passion. “Both my father and my uncle competed in the national championships and built rally cars at home. I’ve been around cars since I was a little kid and both me and my brother ended up here. There’s nowhere else we’d rather be,” says Filip Jaržabek. However tough it may be, this job is a dream come true for many. “As men, we love cars and adrenaline. What I like about rallying is the rivalry. We don’t go to rallies to show off. We come to win. And like the crews, we in the service team experience this to the full,” says Václav Šváb. The opportunity to be involved is the biggest motivation. “I love the atmosphere of rallying. When I used to watch rallies on TV, I never thought I could one day become a part of this circus. And a big plus is that we’re a gang of mates,” adds Vladimír Šťastný. In the morning, the technicians came to us, saying that they weren’t happy with how the gearbox was working and that we needed to replace it. The problem was that we had just a 15-minute service stop, which in reality means about 10 minutes of time for real work. That isn’t much time at all – you need to jack the car up, remove the engine cover and the axle, loosen the steering rack, then the engine specialist has to unscrew the gearbox from above, and out go all the screws and the wiring. And then you have to put everything back faultlessly. It was quite hectic, but we made it. I’ve been in rallying for 10 years and it’s never happened to us that we didn’t complete something on time. QUIZ: Test Your Knowledge of the 2019 Geneva Motor Show!